TS is a 53-year-old male from Singapore. He had been having severe back pain since the past three years, but did not go for any medical treatment. A CT scan indicated a 4.1 x 3.3 x 2.9 cm well-circumscribed rounded solid-appearing mass at the inferior pole of his left kidney. He refused surgery. After five days on the herbs and two sessions of the e-Therapy, all his symptoms were resolved. Kidney Pain: Many people suffer from pain that originates in the back. It may be difficult to an ordinary person to know if this pain is due to back pain or kidney pain. People sometimes equate back pain with kidney pain (1). Pain caused by the kidney is typically felt in the flank or back area just at the lower edge of the ribs on either side of the spine. Kidney pain tends to be sharp and severe and occurs in waves. On the other hand, back pain occurs at the lower or the middle of the back. It is usually due to the muscles, ligaments, or even vertebrae and disks in the spinal column. The pain typically gets worse with movement. The common causes of kidney pain are: stones, infection or pyelonephritis, injury or infarction, cancer, polycystic kidney disease, blocked urine flow, bladder or ureteral spasm (2,3). According to Traditional Chinese Medicine (TCM) lower back pain or abdominal pain may be a sign of disharmony of the Liver (4). Insomnia: Western medicine and TCM have different views about insomnia. To Western doctors, insomnia is the inability to sleep soundly. If there is no obvious physical reason, such as pain, it will usually be seen as an emotional problem such as stress, anxiety, or depression. And the answer for such people is sleeping pills or anti-depressants. TCM considers the root of insomnia as being due to the imbalances of Lung, Heart, Spleen, Liver and Kidney. The two organs most often out of balance are the Heart and the Liver. Each of these two organs houses a specific aspect of the spirit. If these organs are out of balance, they will not be able to house the spirit properly, and the spirit will wander. A wandering spirit, or Shen disturbance, can manifest in a number of ways, including mood disorders, heart palpitations, but insomnia is the most common symptom. For people who may be awake for an hour or so, or may not go back to sleep at all often suffer from a Heart/Spleen deficiency (5). TS (H570) is a 53-year-old male from Singapore. He had been having severe pain in the back since the past three years. But he did not seek any medical treatment. A routine blood test on 8 February 2011 indicated low platelets count (124 x10⁹/L) and one of the liver enzymes (AST =33) was slightly elevated. A follow up CT scan indicated a 4.1 x 3.3 x 2.9 cm well-circumscribed rounded solid-appearing mass at the inferior pole of his left kidney. There was no associated fat or calcification within the lesion. No other mass was indentified within the left kidney. TS also had a diffusely fatty liver. There was a 1.6 cm hypodense lesion within segment 6 of his liver. The appearance is in keeping with a cyst (Figure 1). Figure 1. The left kidney has a rounded solid mass and the liver has a 1.6 cm hypodense lesion. 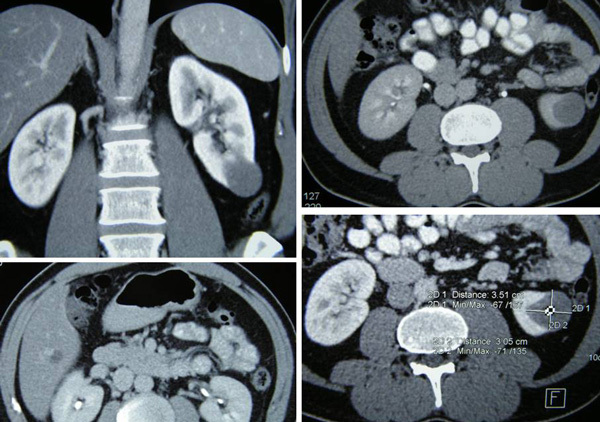 According to the radiology report, his left kidney mass may represent a complex cystic or a solid mass but a renal neoplasm cannot be excluded. A histological correlation was suggested. On 1 April 2011 during TS’s first visit, an AcuGraph reading was taken. It showed low SP and LR meridians while his LU, HT, LI and BL were split (Figure 2). TS came back again on 6 April 2011 after being on the herbs for five days. A second AcuGraph reading was taken. Only his LR and KI meridians were low. The LU meridian was high (Figure 3). So in addition to the kidney herbs prescribed earlier, we decided to correct his LR and KI imbalances by prescribing him Wen Jing (for Liver disharmony) and Jin Gui Shen Qi (for Kidney disharmony). Figure 2. Reading on 1 April 2011. He was prescribed Capsule A, deTox + WF and Kidney teas. Figure 3 Reading on 6 April 2011. He was prescribed Wen Jing (for liver disharmony) and Jin Gui Shen Qi (for kidney disharmony) teas in addition to Capsule A, deTox + WF and Kidney teas. Figure 4. Reading on 4 May 2011. Only the GB was split, the rest of the meridians were normal. This is an amazing healing story. TS’s three-year-old kidney pain problem vanished after two sessions of the e-Therapy. Then his insomnia, blocked nose, wind in the abdomen and burning sensation during urination just resolved after taking herbs for less than a week. This healing story is probably not easy for anyone to believe. But be rest assured it is true!